This is the best premium-large crossover for you if you’re looking for a near-ideal blend of performance, versatility, and solidity. 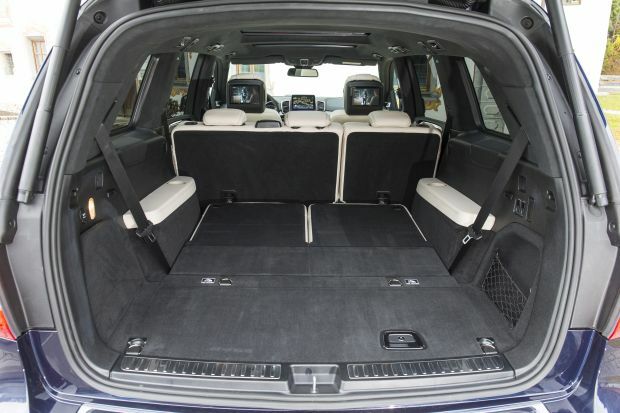 The GLS is Mercedes-Benz’s largest SUV, with three-row seating for up to seven occupants. It is not, however, the brand’s current flagship utility vehicle. That title goes to the smaller, five-passenger G-Class, an even-more expensive, go-anywhere military-based bruiser turned posh street wagon for the Rodeo Drive set. 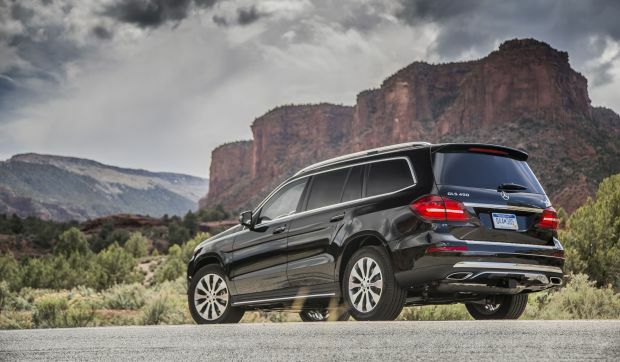 For less image-obsessed high rollers, the GLS makes a strong case for itself. Understated style, vault-like construction, extreme comfort, and powerful engines – as much as 577 horsepower – are among its allures. Generous room for up to seven coddled occupants is a selling point, too. Mercedes introduced a new model-naming strategy for 2017, and the former GL-Class was rebadged the GLS, the “S” intended to link it with the automaker’s flagship S-Class sedan. We think the link is justified. The 2018 GLS’s only update of note is addition of a new wheel design for the entry-level variant. The scant change isn’t unexpected, given the significant refresh the GLS received for model-year 2017, which included revisions to styling and features set. Even well-heeled buyers are making the move to smaller compact- and midsize-class luxury crossovers, but there remains a segment of those for whom size matters, whether they need it or not. Combined sales of Cadillac’s brash Escalade and extended-wheelbase Escalade ESV places them first in this segment. But the GLS isn’t far behind. Go for the ’18. The 2019 GLS is highly unlikely to change in any way worth waiting for – expect perhaps a new color choice or two. And if you’re pining for the return of the diesel-engine GLS model, don’t hold your breath. Sales of the 2017 version were suspended pending an Environmental Protection Agency review into possible exhaust-emissions cheating. The GLS350d didn’t represent a notable percentage of GLS sales, and Mercedes has subsequently indicated a pivot to electric vehicles instead. Thus, the all-gas-engine 2018 GLS lineup returns anchored by the V-6 GLS450 and continuing with the V-8 GLS550 and the high-performance V-8 AMG GLS63, which is tuned by Mercedes’ performance division. The redesigned next-generation GLS is on track for a model-year 2020 launch, so buying an ’18 gets you an extra year or so before the design becomes dated. The sole styling change for 2018 is addition of an alternative design for the 19-inch alloys standard on the GLS450. Otherwise, this tasteful hauler looks precisely as it did when Mercedes-Benz updated it for the 2017 model year. Designers reshaped the grille, headlights, and rear end. All models share the same basic profile, but the high-performance AMG GLS63 gets a tasteful lower body kit, more aggressive wheels, and AMG’s trademark quad-exhaust outlets. Even here, subtlety is the game, with less flamboyance than you’ll get with an Escalade, Range Rover, or Lincoln Navigator. Room in the first two seating rows is exceptional, with plenty of head and leg clearance for even the tallest riders. All seats are highly supportive, with the front buckets bolstered to keep you well secured should you drive aggressively. The second row is a three-passenger bench that feels like an expensive sofa. The two-place third row is one of the friendliest in the competitive set. Access is good, and adults fit with minimal difficulty, though they’ll ride with knees slightly elevated. Cargo space is among best in class, with 16 cubic feet behind the third row, 49.4 behind the second row, and 93.8 behind the first. The GLS control setup mirrors that of other Mercedes-Benz vehicles. Current Mercedes owners will feel at home. Newcomers will want to spend some time with their dealer and the manual to get familiar with the myriad buttons, the function of more than a few not immediately identifiable. Hard to argue with the GLS’ materials quality. Genuine wood trim, soft-touch panels, textured high-grade plastics, and first-class seating surfaces create an inviting ambiance. Even the GLS450’s standard leatherette upholstery is difficult to distinguish from real leather, which is optional. At the other end of the spectrum, the top-line “designo” leather upholstery looks and feel as expensive as it is. Unlike old-school, truck-type SUV construction utilizing a separate body and frame – like the Escalade, Navigator, Lexus LX, and Mercedes’ own G-Class, the GLS employs the more modern unibody design, in which body and frame are integrated into a single structure. This saves weight and makes for more agile handling, although agility is relative in vehicles this large. All 2018 GLS models reprise twin-turbocharged engines and come standard with Mercedes’ 4Matic all-wheel-drive system. The GLS450 has a 3.0-liter V-6 with 362 horsepower and 369 pound-feet of torque; Mercedes says it does 0-60 mph in 6.5 seconds. The GLS550 uses a 4.7-liter V-8 with 449 horsepower and 516 pound-feet of torque, for a claimed 0-60 of 5.2 seconds. Each of these uses a 9-speed automatic transmission. The AMG GLS63 gets a hand-built 5.5-liter V-8 with a robust 577 horsepower and 561 pound-feet of torque. It pairs with a 7-speed automatic transmission and the automaker says it does 0-60 in just 4.5 seconds. Mercedes’ 4Matic all-wheel drive is standard across the board and is calibrated for a slight rear-wheel-drive-biased feel. For sportier handling, the AMG GLS63’s 4Matic system is tuned for more rear bias. The GLS63 also has a stiffer, performance-oriented suspension that reduces ground clearance to 7.8 inches. The other models have a substantial 8.5 inches of clearance but aren’t intended for serious off-road use. That is, unless you add the $2,850 Off-Road Package to your GLS450 or GLS550. Available by special order only, it adds protective underbody skid plates, hill-descent control, additional ride-height settings for the standard adaptive air suspension, and a two-speed transfer case with low-range gearing. Mercedes Dynamic Select system also returns as standard equipment on all 2018 GLS models. This gives drivers a console dial that can transition transmission, throttle, and suspension settings among Normal, Comfort, Slippery, and Sport modes. The Off-Road Package adds settings for traversing parts unknown, while the GLS63 adds a performance-enhancing Sport+ mode. We suggest leaving Dynamic Select in its default Normal mode for nearly every driving condition. Comfort can cause the ride to become bouncy, even on seemingly smooth pavement. Sport and Sport+ turn the ride brittle and quicken throttle response enough to trigger jerky takeoffs from a stop. The 2018 features set reprises the 2017 model’s extensive array of standard and optional equipment. Every ’18 GLS comes standard with heated front seats, driver-seat memory, power rear liftgate, and power-folding third-row seatbacks. On the safety front, you’ll get standard forward-collision warning with autonomous emergency braking that can stop the crossover to avoid a frontal collision. Mercedes doesn’t see fit to include as standard on all models radar cruise control to maintain a set distance from traffic ahead, or automatic steering correction to keep you in your lane. These driver aids are standard on the AMG GLS63, but require spending more money to get them on the GLS450 and GLS550. Given this crossover’s $70,000-plus starting price, Mercedes makes a few other odd packaging decisions. For example, the GLS450 doesn’t come with conveniences such as keyless entry with pushbutton ignition, Apple CarPlay, Google Android Auto, or satellite radio. They’re part of the $3,830 Premium 1 Package. This package is required to get the $2,250 Driver Assistance Package, which includes the aforementioned radar cruise control and lane-maintaining steering. 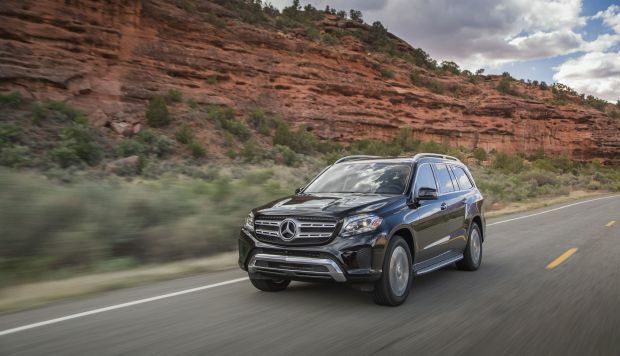 The GLS550 includes the Premium 1 Package’s amenities as standard, along with leather upholstery, and Mercedes doesn’t require you to order anything extra-cost packages to add its $1,375 Driver Assistance Package. The GLS63 comes pretty much fully equipped, save a few standalone extras, which we address below. All versions of the 2018 GLS come with five years of Mercedes’ mbrace Connect telematics. This includes remote control of engine start, locking and unlocking, and vehicle diagnostics. Like roadside assistance and more, they’re accessible online or via your smartphone. Other mbrance amenities available for a monthly or yearly fee include emergency crash notification, real-time concierge services, and built-in WiFi hotspot support. Despite furnishing no new content, Mercedes raises base prices for the 2018 GLS $920-$1,900, depending on trim level. Base prices listed here include the automaker’s $995 destination charge. The 2018 GLS450 starts at $70,545, the GLS550 at $95,945, and the GLS63 at $126,295. Most buyers choose a GLS450 and Mercedes takes the initiative of equipping more than 90 percent of this model with the Premium 1 Package. Among other available GLS450 extras are the Appearance Package ($1,340), which includes illuminated running boards and 20-inch wheels. The $1,390 Lighting Package includes LED headlights and automatic high-beam control. The Parking Assist Package ($1,290) includes hands-free parallel parking and a surround-view camera. The ACTIVE CURVE SYSTEM Package ($3,700) adds variable front and rear stabilizer bars and suspension dampers that can react in real time based on driving speed and lateral acceleration to enhance handling. Leather upholstery ranges from $1,620-$4,900, depending on the grade you choose. Multi-contour front seats with built-in massage are $1,100. Ventilated front seats are $570. Power soft-close doors add $550. Three-zone automatic climate control is $1,450. Heated and cooled front cupholders are $180. A Harman/Kardon audio system is $850. A panoramic sunroof is $1,090. Heated second-row seats are a $620 option for the GLS450 and GLS550. Available on all three models are various paint colors ($360-$795), power-sliding second-row seats ($400), cabin air purification system ($280), second-row side window sun shades ($380), Class IV trailer hitch to increase towing capacity to 7,500 pounds ($575), and a rear-seat entertainment system ($1,950). An audiophile grade Bang & Olufsen sound system for the GLS550 and GLS63 will cost you $5,400. GLS63 exclusives include an engine cover made out of carbon fiber ($1,500), blackout exterior trim, dubbed the AMG Night Package ($300), and red-painted brake calipers (no charge). With big SUVs such as the Chevrolet Suburban, Ford Expedition, and Toyota Sequoia offering similar room and utility at tens-of-thousands of dollars less, it’s difficult to call any premium-class alternative a good value. But if you’ve got the dough, the GLS does deliver a cut-above experience. A GLS450 equipped with most features you’ll want easily sets you back more than $90,000. A GLS550 can top $100,000 without breaking a sweat. If you’re going to spend that kind of cash, it may be tempting to stretch for an AMG GLS63. Its sharper handling, delightfully fiendish exhaust note, and subtle styling enhancements make it uniquely appealing. Good gas mileage is seldom a concern for buyers of high-end luxury SUVs, and the GLS runs with the pack. EPA fuel-economy ratings are 17/22/19 mpg city/highway/combined for the GLS450, 14/19/16 for the GLS550, and 13/18/15 for the GLS63. All models require premium-grade 91-octane gasoline. The next-generation GLS, which will probably arrive for the 2020 model year, will serve as the basis for a new Mercedes flagship SUV. It will sell under the Maybach sub-brand, be priced at $200,000 or more, and be designed to compete with the Bentley Bentayga and upcoming Rolls-Royce Cullinan. So ultra-high-rolling Mercedes loyalists may want to hold on to their current GLS or G-Class vehicles for a little while longer. Audi Q7, less costly than the GLS, but no match for room, available power, or overall prestige; Cadillac Escalade, a unique presence, sure, but poor third-row accommodations keep it a step behind the GLS; Lexus LX 570 and Toyota Land Cruiser, functionally identical and fundamentally unchanged for years, these big SUVs best the GLS for off-road ability but not for on-road performance or spaciousness. Frankly, the GLS is our pick for best in the premium full-size SUV class, but if it can be topped, you might look to the Bentley Bentayga. It’s perhaps not a direct competitor because seats five and bowed with a $231,845 base price. But no big SUV for sale right now can match the Bentayga’s overall performance, country-club ambiance, and hand-built craftsmanship; the other worthy alternative is the Range Rover, a capacious five-seater that blends prestige, style, luxury and power with amazing off-road ability to create a rival with a less family-oriented vibe than the GLS .